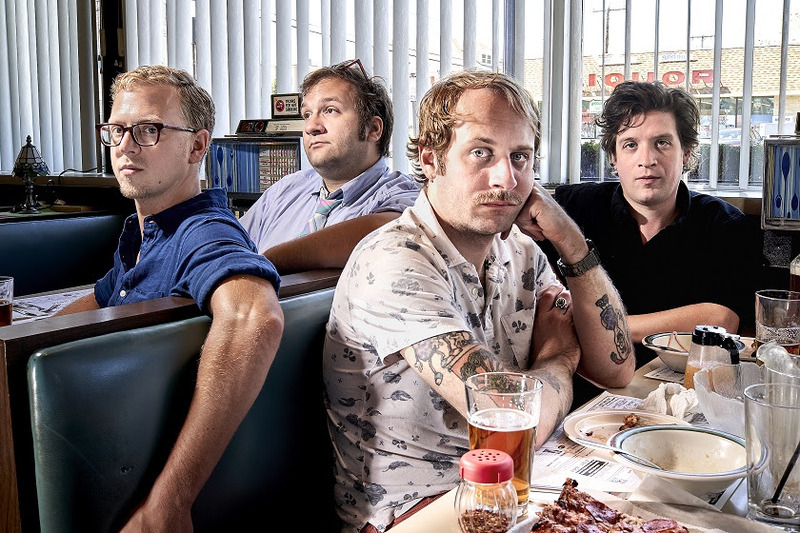 When Rhode Island’s Deer Tick returned after a four-year gap they were obviously intent on making up for lost time and released two albums of new material which showcased their ability to switch from punky alt-rock to melancholy Americana without missing a beat. The ‘Twice Is Nice’ tour followed and the artistic rejuvenation of the band continued at a pace. This rush of activity finds a logical conclusion with ‘Mayonnaise’ which acts as both a companion piece to the recent albums and a nice memory jog if you were lucky enough to catch the guys on tour. ‘Mayonnaise’ is a pretty cool release and should prove essential to fans who will find plenty of interesting stuff to get their teeth into. A mix of new material, alternate versions of recent tracks and cover tunes performed on the tour ‘Mayonnaise’ is more a rich hearty stew than a mere condiment. ‘Spirals’ is an interesting choice to open the record. A thick dark, treacly stomp laced with discordant guitar lines and an underlying hint of menace. In typical Deer Tick fashion expect the unexpected and you’ll be good to go. Of the other new material ‘Old Lady’ finds McCauley’s drawl used to good effect while ‘Strange, Awful Feeling’ highlights the vocal harmonies over picked guitars and spacey drums. ‘Hey! Yeah!’ is really cool, in an infectious foot-tapping Americana goes power pop kinda way, while the short and sweet late-night jazzy instrumental ‘Memphis Chair’ works as a fun musical interlude and reminds us that Deer Tick are willing to play outside any genre pigeonholes. Regarding the material that originally featured on Vol.1; Spencer Cullum Jr. of Steelism adds typically wonderful pedal steel guitar colour to ‘Cocktail’ at the expense of some of those lovely piano lines on the original. ‘Cocktail’ always had a sound of the border feel musically which is emphasised by the pedal steel. ‘Doomed from the Start’, ‘End of the World’ and ‘Limp Right Back’ are the other tracks revisited here. These alternate versions sound great, not strikingly different but in some ways cleaner sounding than the originals with the picked guitars on ‘Doomed’ standing out while ‘End’ seems more trippy and ambient this time around. As I mentioned earlier studio versions of cover tunes the band performed on their recent tours are included here. The Pogues never really did anything for me personally so ‘White City’ is well done but it is what it is while I found the likes of Ben Vaughn’s ‘Too Sensitive For This World’ to be far more to my taste. Deer Tick do a great job of making this their own with the original’s organ and gospel-influenced backing harmonies present but given a Deer Tick tweak. ‘Paul Blue Eyes’ the Lou Reed/Velvet Underground track has been covered by all manner of acts over the years with Patti Smith, Hole (very scary) and R.E.M. just three of many. Deer Tick’s version is faithful to the core of the original and thanks to some nicely judged percussion choices and an upfront bass guitar track this works really well. The covers are rounded out by George Harrison’s ‘Run of the Mill’ originally from 1970’s sprawling ‘All Things Must Pass’ set. A very important song in post-Beatles lore ‘Run of the Mill’ is treated with reverence and the brass is surprisingly not missed. Danny Kiranos aka Amigo The Devil arrives on the scene with ‘Everything Is Fine’ and the one thing I can tell with absolute certainty is that things most definitely are not fine. In fact, we’re as far from fine as it’s possible to get. “This life is a joke and death is the punch line” gives you a good idea of Kiranos’ state of mind as Amigo The Devil. So join me, if you’d like to partake in an hour or so of Southern gothic murder folk country, with an occasional hard rock/metal left turn, because you never know things might turn out fine in the end, but I wouldn’t bet on it. The really great thing about country music these days is the wide range of music associated with the genre. If you like your country with that Nashville sheen, or maybe look for something a little more pop or bro it’s out there. If you’re looking for a good old-fashioned tune, that’ll bring a tear to the eye because your dog died, or your wife/significant other left you, it’s out there. In many ways, due to the sheer weight of music being produced these days there really is something for everyone. I’m happy to check out pretty much anything under the country/Americana banner but I must admit that you can’t beat an album that sounds old-school and timeless yet current. With that in mind, J.P. Harris has delivered a record that feels right, looks right and above all sounds right. RGM first encountered Josh Taerk in late 2017 with the release of his ‘Stages’ EP a five track collection full of lyrical positivity and melody. Less than a year later and Josh is back with ‘Beautiful Tragedy’ which takes up where ‘Stages’ left off. I’m pleased to report that despite a serious haircut Josh hasn’t endured a Samson style loss of his creative strength. S. K. Wellington’s debut EP is the lovingly-nurtured baby of Canadian singer-songwriter Sarah Kemmers. It follows a long period of stepping back from her musical endeavours to stop, reassess and rekindle her creative fires. As a result there’s a confident, easy and nothing-to-lose vibe coursing through this four song collection which significantly contributes to its appeal. Ruston Kelly has one of those back stories so strange you couldn’t make it up. Born in South Carolina Kelly's early childhood was fragmented as his dad worked in paper mills and travelled often for work, so every couple of years the family upped sticks. In his early teens Kelly hoped for a career in figure skating, so he moved to Michigan and joined an Olympic coaching team, which proved to be a very tough and lonely existence. Those dreams didn’t pan out, but with the music of Jackson Browne and his dad’s old guitar for company, the songwriting seed was sown. It wasn’t until his senior year in high school that he discovered The Carter Family and Johnny Cash in, of all places, the Belgium city of Brussels that things really started to click. At seventeen he returned to the USA and moved in with his sister in Nashville. Eventually, in 2013 a publishing deal was signed and Kelly placed songs with Josh Abbott and Tim McGraw — that helped pay the rent — before he snagged his own record deal and released the ‘Halloween’ EP in 2017 to impressive reviews. For the ninth studio album of their twenty-year career, Lucero were seemingly keen to switch things up a little. After a run of albums with producer Ted Hutt that utilised horns and more complex arrangements to fashion a Memphis soul-influenced sound (they even found room to slip in a tune by Memphis’ favourite sons Big Star) frontman/songwriter Ben Nichols and the band went in search of inspiration. They found it in the rear view mirror as ‘Among The Ghosts’ strips the arrangements back to their very foundations and reveals a darker sound more in keeping with their roots. When coupled with a change in Nichols’ approach to his writing, bought on by a settled family life and the birth of his daughter, the results are impressive. The horns may have gone but the soul remains. Formed way back in 1985, Cowboy Junkies have become something of a Canadian institution over the decades with a run of albums released to both critical and fan praise. Things started off on a slightly unusual note with a covers album ‘Whites off Earth now! !’ before their sophomore release ‘The Trinity Sessions’ would put them on the world map selling over a million copies. Thirty years on from that particular landmark Cowboy Junkies return with their first album since 2012’s ‘The Wilderness’. This new release has been referred to by songwriter-guitarist Michael Timmins (one of the three Timmins siblings that form 3/4 of the band) as “These songs are about reckoning on a personal level and reckoning on a social level”. With this in mind, and as few bands do reflective melancholia better than Cowboy Junkies, this should be good.